Many of you have probably heard of the STEM pipeline dripping – that is, the idea that we’re losing lots and lots of students at each step of the educational process. Perhaps the step that is most relevant to me as someone who wants to go on to be a professor: only about half of those students who enter college in a STEM major will graduate with a STEM degree. This is already a sad pronouncement – we are losing so many of our students to things like poor class and assessment design, a lack of awareness of mental health issues, and a dearth of research opportunity to keep people engaged. These are all problems that, as a student of the PROFESS program at Drexel, I aim to learn about fixing. Me, a young woman scientist, STEMMING it my senior year in undergrad. But to actually have an impact, I will need to become a professor – and the STEM pipeline prognosis for women, and for minorities, is sadly far worse than that for overall scientists. According to a UC Berkeley study on chemists, women make up roughly 50% of college graduates in the field – but only 37% of PhDs, 22% of associate professors, and a measly 12% of tenured professors. There are many things that explain this ‘drip’ of women from the field (feels more like a gush than a drip, honestly) – they include everyday sexism from the ‘good old boys club’ of science that goes all the way to the top, wanting to earn higher salaries outside of academia, or needing time to start a family – which might not be compatible with the format of tenure-track jobs. And this idea, that men in science are actively not supporting women in science, has some pretty significant data behind it. 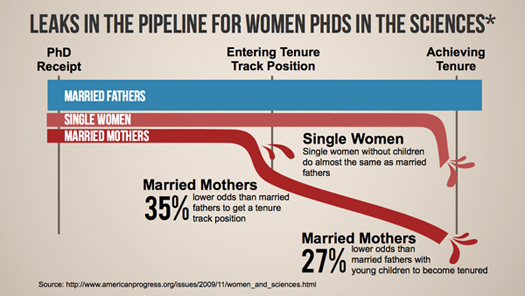 An article in PNAS showed that elite labs run by men (and regular labs run by men) were significantly less likely to hire/train women PhD and postdocs than those run by women. In contrast, elite labs run by women were more likely to hire women than men – but by a less significant margin; and non-elite labs run by women showed no bias, unlike non-elite labs run by men. This problem is multiplied by the fact that there are more Academy/elite male scientists than females (in Chemistry, females make up only 6% of the National Academy of the Sciences chemists) – which means that in 94% of elite labs there’s an anti-woman bias. The study in PNAS does indicate that they don’t know how many women applied to work in these labs – though they cite high rates of sexual harassment and negative attitudes towards maternity as reasons why many women may steer clear of male-dominated labs. The bottom line is that women in STEM are not being treated fairly or given access to equal opportunities – not really surprising, given how recently women were even allowed to start having careers at all. Undeniably, women have made incredible strides in the last sixty to eighty years – at least at the undergraduate level. But the anti-woman bias held by the ‘good old boys club’ that has been the norm for the past 600 years of science needs to change and effort needs to go into enacting policies that work from the top down. Policies that support women in cases of sexual harassment, hiring bias, and family planning. Until these policies are enacted, no matter how many chemistry sets we give our young girls, we will not see a change in the gushing STEM pipeline for women.